Millenia ago, King Indradyumna started the ceremony of bathing (snana-yatra) Lord Jagannatha with 108 pots of sandal-scented well water. At that time, Jagannatha Swami told the king that for fifteen days after snana-yatra, no one should see the Deities. Snana-yatra occurs on Jyestha Purnima (June full moon), one of the hottest days of the year. Skanda Purana says that Bhagavan Sri Krsna manifested His Daru Brahman form as Jagannatha Swami on this day. Therefore, Jyestha Purnima (Snana Yatra day) is the appearance day of Lord Jagannatha, which is Sri Krsna’s mahabhava-prakasa form depicting His devastation in separation from Srimati Radhika..
Just after sunrise, Balabhadra, Sudarsana, Subhadra and finally Jagannatha are brought in a hopping style procession to the bathing platform located on the northeast corner of the temple’s outer boundary wall. The Deities stand the whole day within public view under a multi-colored canopy. Pujaris bathe the Deities (abhiseka) with 108 golden water pots of refreshing sandal-scented water. 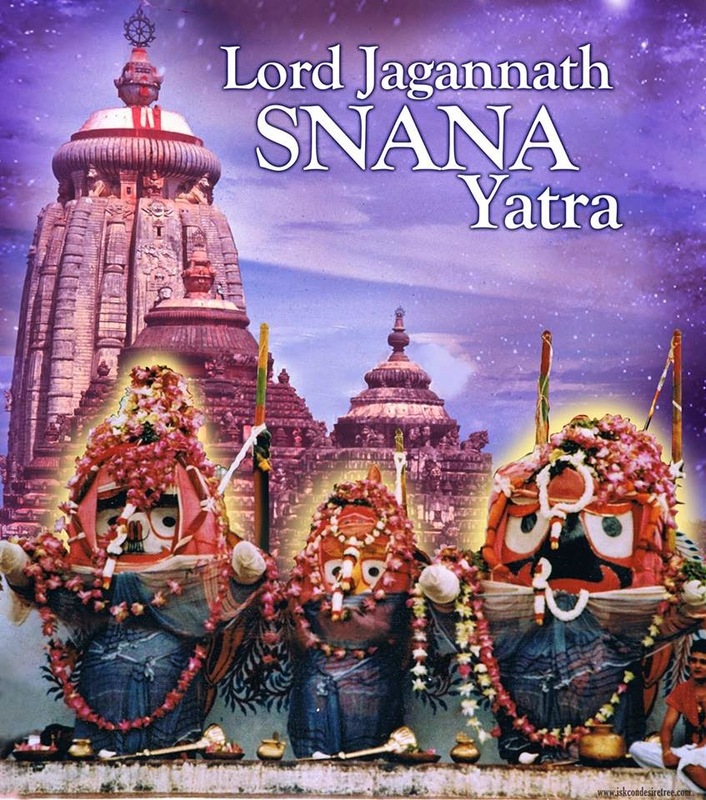 From Snana-yatra until the end of Ratha-yatra, Jagannatha Swami is cared for by a group of pujaris called Daityapatis, who are descendants of the brahmin Vidyapati and Lalita, the daughter of the tribal (Sabara) chief Visvavasu. In late afternoon, the Deities appear in a striking outfit that looks like the head of an elephant; complete with trunk and big floppy ears. This dress is called Hati-vesa, which Lord Jagannatha once displayed to express His love for a devotee. Ganapati Bhatta, a devout servant of the elephant demigod named Ganesh, once visited Sri Ksetra. Beforehand, he was told that Jagannatha Swami is the supreme God and reveals Himself to every worshiper according to his individual mood. Expecting to see his lord Ganesh in Jagannatha, Ganapati Bhatta once attended Snana-yatra. But not seeing Ganesh, he went away disappointed. The all-merciful Lord Jagannatha secretly appeared as a brahmin and convinced Ganapati Bhatta to return for another darsana. Arriving before the Deities, Ganapati Bhatta saw Lord Jagannatha with the head of an elephant and thus fulfilled his desire. Bhakta-vatsala Jagannatha Swami ki jai!